This is UK-based Alexander Tucker's third release for ATP Recordings. "Portal is a work of such unparalleled bewitching splendor, that any rote comparisons would read like hyperbole, thus doing it a great disservice. 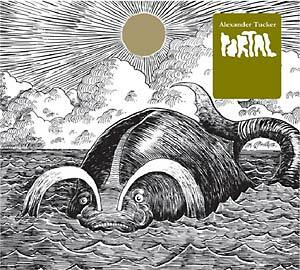 Even Tucker's previous albums Old Fog (2005) and Furrowed Brow (2006) seem like stepping stones in the wake of Portal. But if we must draw comparisons, then let's say Chicago musician/composer/innovator Jim O' Rourke; both are unparalleled in their pairing of the 20th century avant-garde techniques of composers like Stockhausen and Steve Reich with the archaic sounding free-folk of John Fahey, Robbie Basho and Loren Connors. The late Karlheinz Stockhausen envisaged music where "instead of very precisely formed single notes there are little complexes... little crystalline blooms that pass through a register form." During Portal, Tucker's finger-picked guitar lines become indistinguishable from the more traditional string arrangements and voice. These melodic clusters interweave like the paths incurved by a figure skater. This is still to say nothing of Tucker's voice, which sounds as if it is emanating from a ghost channel on an ancient mixing desk rather than sung on top of the epochal arrangements. It's a voice comparable perhaps to Meddle-era David Gilmour or John Martyn on Solid Air. These are big claims of course, but then Portal is a work of such extraordinary majesty that even trying to surmise it in words seems like a heresy. If you disagree after listening, then I'm sorry to inform you that you are spiritually dead." --Tony F. Wilson; Portal clearly shows that Tucker has even further honed his droning looped guitar technique with ever more mesmerizing effect, adding strings, vibes, bells and a sorcerer's range of well-placed, far-out effects.